There are two things that incense me about this story. The first: that the city of Miami screwed up and now wants the media not to do its job. The second? That at least one of the alleged perpetrators of a horribly racist act looks black AF, and willingly participated in this anti-black fuckery. He probably identifies as “Hispanic, not black” on forms, but the man in the mirror says otherwise, my dude. After mistakenly releasing the pictures of six firefighters who were fired over a noose incident in a firehouse, the city of Miami is demanding that media take down the photos. The Miami Herald reports that shortly after midnight Friday, an attorney for the city sent a cease and desist letter ordering several outlets to stop showing the photos of the six men. The lawyer said that they were not supposed to have been released. “As former first responders, their photos are confidential and exempt under Florida’s public disclosure law and should not have been released,” city attorney Kevin R. Jones wrote. The Miami Herald then told the city to … well, let’s just say the photos are still up because they were legally obtained. The photos reference a Sept. 9 incident at Miami Fire Station 12, where firefighters Kevin Meizoso, David Rivera, Justin Rumbaugh, Harold Santana and Alejandro Sese were accused of taking the family photos of Robert S. Webster, an African-American lieutenant, drawing penises on them and then hanging a thin white rope fashioned into a noose over one of them. The six firefighters were fired Wednesday. Bryson is the son of former Miami Fire Chief William W. “Shorty” Bryson, Miami Local 10 reports. Another five employees remain under investigation and are facing possible discipline. 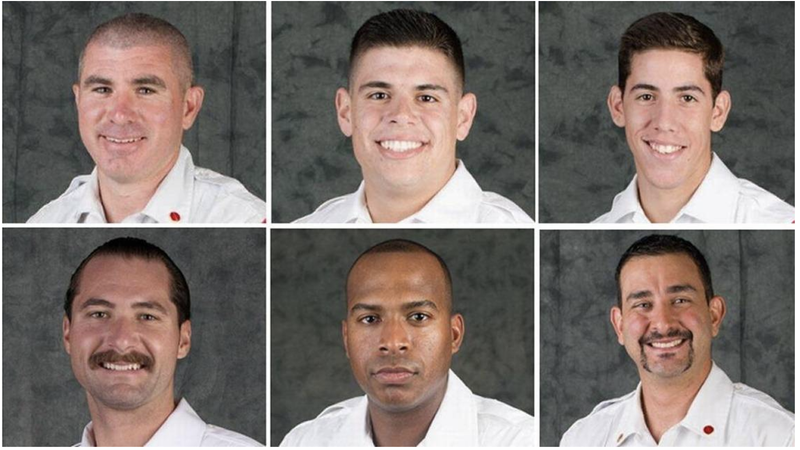 On Thursday, after the city released the photos of the six fired firefighters, it received an email from an attorney representing Miami’s fire union, warning that the city may have set itself up for a lawsuit. The city then obviously tried to cover its arse, but that cat was already out of the bag.